You are currently browsing the tag archive for the ‘Egghead’ tag. ‘Cinderella meets Fella’ is Tex Avery’s second take at a classic fairy tale after ‘Little Red Walking Hood’ (1937). The cartoon’s opening scenes are one string of nonsensical gags, from the invitation card with which it starts to Cinderella’s arrival at the ball. For example, to get warm, Cinderella just adjusts her candle to get more flames. And when the fairy godmother is late, Cinderella calls the police to look for her. To get mice for the couch, the fairy godmother plays a slot machine, which incomprehensibly is built in the wall. Gags like these were completely unique at the time and could only be found in Warner Bros. films, and in Avery’s films in particular. Prince Charming turns out to be Egghead, Tex Avery’s second cartoon star, after Daffy Duck. Egghead unfortunately is just too odd and too unsympathetic to carry the rest of the cartoon. So the short deflates a little after his entrance. But the cartoon is revived by the extraordinary end gag: Egghead finds out that Cinderella got tired of waiting and has gone to a Warner Bros. show. Egghead is heartbroken, until he’s called by his love from the audience. We watch a silhouette standing up, and within seconds she’s back on the screen. It’s great gags like these that made Tex Avery the undisputed innovator of cartoon comedy. ‘Cinderella meets Fella’ is undoubtedly one of the funnier cartoons of 1938, but when Avery would revisit this particular fairy tale seven years later, with ‘Swing Shift Cinderella’, the results would even be much, much better. In this slow and only moderately funny cartoon Elmer tries to photograph nature, but he’s hindered by a predecessor of Bugs Bunny. This goofy rabbit is not quite Bugs, even though he behaves very calmly and does a Bugs-style death act. 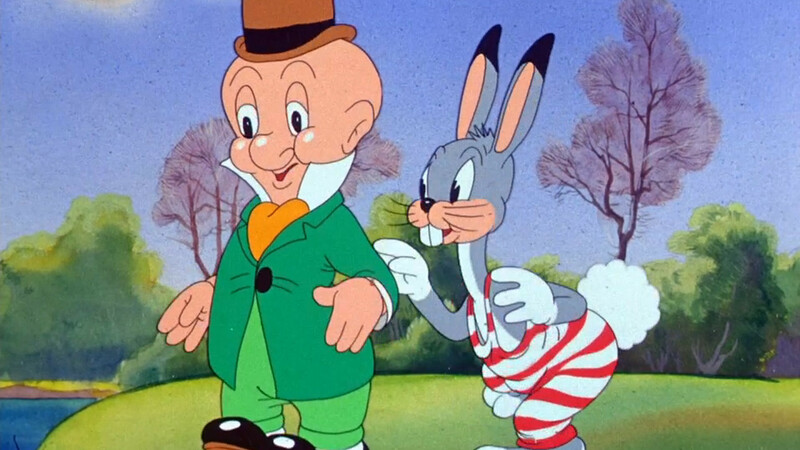 His looks and sounds are those of the crazy rabbit in ‘Hare-um Scare-um‘ (1939) and he still has the Woody Woodpecker-style laugh introduced in ‘Porky’s Hare Hunt‘ (1938). Jones has toned this loony fellow down, but it was to Tex Avery to introduce a really cool rabbit in ‘A Wild Hare‘ from four months later. No, the importance of ‘Elmer’s Candid Camera’ lies in the fact that it marks Elmer’s debut. Although he’s still wearing an Egghead suit (the character from which he evolved), he lacks Egghead’s goofiness, and he has received his distinctive voice provided by Arthur Q. Bryan. Moreover, he utters his famous line “wabbit twacks” for the first time here. Unfortunately, ‘Elmer’s Candid Camera’ is more historically interesting than entertaining, and outside its historical importance, the cartoon is quite forgettable.